Parents of kids with food allergies, are more confused now than ever regarding the warning labels on food products, a new research shows. The study, which was published in the Medical Journal of Australia, noted that regardless of their child’s history of the potentially life-threatening allergic reaction anaphylaxis, these parents were complacent towards the warning on the labels. The research was conducted on 246 children affected by food allergy and who attended the Department of Allergy at the RCH between August and October, 2011. Professor Katie Allen, Director of Population Health at Murdoch Children’s Research Institute in Melbourne and her team surveyed parents of children with food allergies to find if the precautionary labels were helping these parents make more informed decisions on what to buy for their kids. The team found that warning labels such as “may contain traces of”, were now present on more than half of all packaged processed foods in supermarkets in Australia(and other countries). But previous studies had suggested that because of the high prevalence of the same warning in almost all food products, and the shoppers knowing that such labels were a voluntary measure, they might not have been seriously paying attention to the warnings. The researchers believe that because of this the parents might be putting their children at risk of consuming products that could be allergic to them. When the parents were questioned during the survey, those of 54 kids with a history of anaphylaxis said that ‘the ingredient list information on food labels was easy to understand or use” but only six (5.4%) reported that they could “completely trust” the labels. Between 78% and 84% of parents of children with a history of anaphylaxis considered warning labels “not useful”. They said additionally that just from the warning label they could not know for sure if the food was safe to eat. The researchers found that parents of kids with a history of anaphylaxis as well as those without the condition could read the labels well. 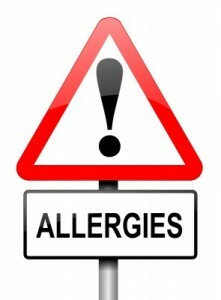 However the parents who had already dealt with the condition had a high likelihood of removing any food from their home that they thought had an allergen irrespective of the label. The authors concluded that the label statements need to be fewer and more affective in clearly sending out the message to parents. A recent report by the Centers for Disease Control and Prevention (CDC) suggests that in American children the incidence of food and skin allergies has increased in the last few years. A clearer warning label can therefore help parents immediately select foods that is safe and those that are not.